Oklahoma State University (OSU) varieties continue to hold steady in acres planted of Hard Red Winter Wheat across the state of Oklahoma, according to the April 2019 “Oklahoma Variety Report” from USDA National Agricultural Statistics Service. For the second year in a row, the top four leading wheat varieties planted in the state were developed by OSU with another two listed in the top seven. A few changes appeared in the lineup compared to last year with the Gallagher variety still holding the top spot. This year we saw an increase in plantings with the variety Doublestop CL Plus, and the same amount of acreage planted to Bentley, with a slight decline in acres planted to Iba. The old standby varieties Duster and Endurance appeared in the sixth and seventh spots on the survey list. (Other OSU varieties listed in the survey on Oklahoma planted acres included Ruby Lee, Smith’s Gold, Deliver, OK Bullet, Billings and Garrison.) The roots of success continue to be firmly anchored with several other up-and-coming OSU varieties being adopted by Oklahoma wheat producers. In 2017, three new varieties Smith’s Gold, Spirit Rider and Lonerider were released. Smith’s Gold broke out in the top 20 this planting season, a positive note for being released only last year. In addition to these varieties listed, OSU also released four new wheat varieties in the 2018 year: Showdown, Green Hammer, Bakers Ann and Skydance. Gallagher, the leading variety of all wheat seeded in Oklahoma, accounted for the largest percentage of the state’s 2019 planted wheat acres. The primary area of adaptation for this Duster offspring is from the northern regions of Texas to the south central region of Kansas and throughout the Hard Red Winter wheat production area of southern, central and north central Oklahoma. 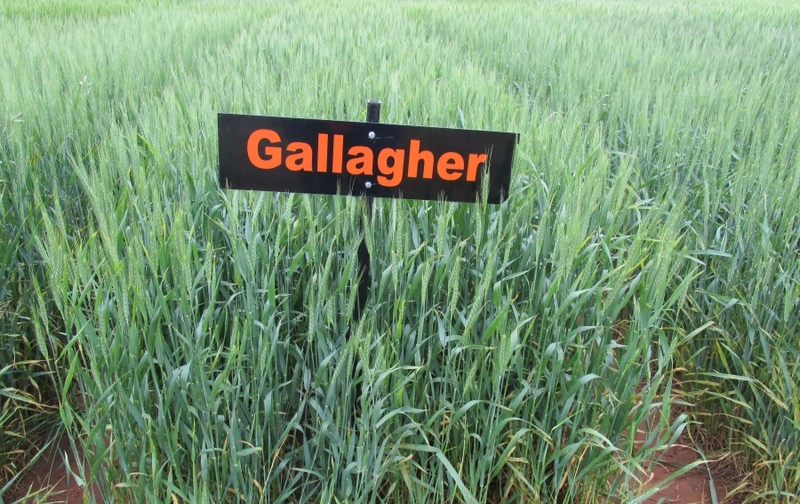 Gallagher, though an early maturing variety, is known for its good graze-ability, disease resistance and Hessian fly resistance. It is resistant to leaf rust, powdery mildew and moderately resistant to barley yellow dwarf. It is resistant to the wheat soilborne mosaic and wheat spindle streak mosaic complex, and to stripe rust in the adult-plant stages. Gallagher has intermediate septoria leaf blotch resistance for no-till high residue systems. This variety also has the ability to exceed 12 percent wheat protein with adequate fertilization. It also carries a key segment of a rye chromosome that lends greater yielding ability, but unlike most varieties with this feature, Gallagher has provided above-average milling and baking quality. Doublestop CL Plus, with its two-gene Clearfield technology, offers improved weed control of problem weeds such as feral rye and jointed goat-grass. It has excellent test weight with late-maturity and exceptional protein content and quality. Yield stability of this variety across a wide range of environments is a virtue, including drought stressed and high-yield systems. This variety has an Endurance-type graze-ability with acceptable forage production and late first hollow stem. It is tolerant of acid soils and is resistant to leaf and stripe rust. It is resistant to wheat soil borne mosaic, and recently was confirmed to have moderate resistance to wheat spindle streak mosaic. Bentley, which saw an increase in planted acres last year, has good forage production with excellent recovery from grazing. With late first hollow stem but medium heading, it offers extended grazing without delay in harvest. Bentley is moderately tolerant of acid soils, and its test weight is below average, so timely harvest of Bentley is important. It has moderate resistance to tan spot for no-till production systems. The Bentley variety has intermediate resistance to most foliar diseases and is likely to tolerate light to moderate disease infection but will require a fungicide in years with heavy leaf rust pressure. Iba, a variety also with Duster parentage, has outstanding test weight and a broad area of adaptation with proven yielding ability in performance tests from Kansas to Texas. It is resistant to current races of leaf rust, and moderately resistant to powdery mildew, tan spot and barley yellow dwarf, but susceptible to septoria leaf blotch. It is resistant to the wheat soilborne mosaic and wheat spindle streak mosaic complex. Iba is best suited for soil pH of 5.5 and above, and adequate nitrogen fertility is required to ensure 12% wheat protein. Duster has been a consistent top performer in OSU wheat variety tests for several years. It performs well in both grain-only and dual-purpose systems, and has above-average tillering ability that allows it to recover well from grazing. It emerges well in hot, dry soil conditions and closes the canopy rapidly. These traits, along with good forage production and medium-late first hollow stem, make Duster a nice fit for dual-purpose production systems. Duster is considered to have the strongest resistance to leaf rust in winter wheat, due in part to an unusual combination of multiple adult-plant resistance genes. Moderate susceptibility to tan spot and septoria means Duster should be monitored for these diseases in continuous no-till wheat production systems. As with Gallagher, Duster is highly resistant to the Great Plains biotype of Hessian fly. This is of particular benefit to producers wishing to sow early to maximize forage yield or those who no-till wheat after wheat. Endurance wheat, a mainstay released by Oklahoma State University Wheat Improvement Team in 2004, has performed well in dual-purpose and grain-only systems throughout the state of Oklahoma and beyond. It shows an unusual ability to break winter dormancy consistently late from year to year, yet will catch up on heading date relative to Duster. Still Endurance finishes relatively late and often benefits from moderate temperatures during May. Years of yield data indicate that Endurance has the ability to maintain good yield potential in a wide range of stress environments as well. Given these attributes, it should be no surprise that the OSU Wheat Improvement Team has used Duster and Endurance as a sturdy foundation for creating new, improved varieties. Thanks to wheat improvement programs like the one at OSU, producers continue to have improved options of wheat varieties to plant. Whether it is improved stress or pest tolerance or increased yields, at the level of end-use quality expected by our food industry, the Oklahoma Wheat Improvement Team at OSU is working to develop varieties that are meeting producers’ changing needs. Most importantly, OSU wheat varieties are locally adapted but globally marketed. It is important to note the varieties released by the Wheat Improvement Team at OSU have been through several years of testing for quality-based attributes that domestic and foreign customers expect in their milling and baking operations. Variety development programs that rush a variety to release may not provide the same level of scrutiny for end-use performance. By finding important traits that are beneficial to grain buyers, the OSU Wheat Improvement Team is also working to capture more market share for the farmer by creating varieties that have the most benefit for end users. Smith’s Gold- First Gallagher progeny with better leaf hygiene, an excellent GrazenGrain™ variety with later pull-off date; and improved baking quality as verified by Wheat Quality Council. Resistant to Hessian fly and greenbug. Improved resistance to stripe rust over Gallagher. Excellent flavor profiles appropriate for any bread maker, with less bitter and tannic flavors, making it also suitable for fresh noodle pasta making. Ruby Lee- an excellent grazing variety with large seed size and outstanding milling and baking quality.